Home > Blog > Pond Tips & Tricks > What Is The Best Pond Depth? Those who are planning to construct a new pond, or renovate an existing one, will need to consider the size. This includes both the width and depth, and there is much debate in the pond community regarding how deep the ideal pond should be. In reality, the ideal depth is dependent on numerous factors, which will be explored below. 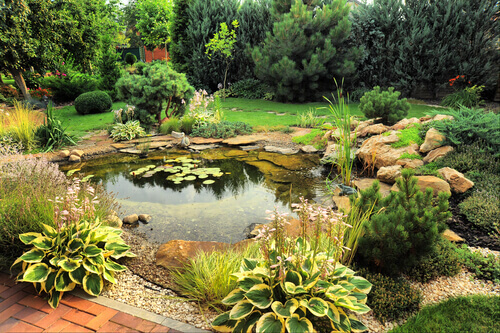 Most experts will recommend constructing a pond with a minimum depth of 60 cm, which is roughly two feet. The reason for this is so that the animals within will be adequately protected from extreme weather conditions, either hot or cold. A pond which has a depth of two feet is ideal for frogs, which will be able to hibernate, and fish will have sufficient space and oxygen. A deep pond is one which is stable. During winter it will not freeze completely, and as a consequence will provide sufficient aeration to keep the animals alive until spring. However, in areas that don’t have extreme weather conditions, some pond owners say that they’ve been able to get away with a depth of about twenty five cm. A lot depends on the environment and the animals which are present; the ideal pond depth in New England may not work in South Florida or the Caribbean, and vice versa. Pond owners who live in the UK and other parts of the Northern Hemisphere have reported that even during the coldest winters their fish, beetles, dragonflies and invertebrates were able to survive, sometimes in depths of fewer than two feet. When frogs or fish died however, it was almost always a result of a lack of oxygen. However, cold weather isn’t the only thing that pond owners should pay attention to. Those who own ponds in tropical or subtropical climates must also consider excessive heat and sunlight as a potential danger. The best depths for ponds in these climates are about four feet. A pond which is shallow, especially in a hot climate is vulnerable to water evaporation resulting from sunlight which could expose the fish to open air. A shallow pond also makes it easier for predators such as cats, foxes and raccoons to attack your fish. It is essential for a pond to have enough depth so that the fish have space for when the weather turns hot or cold. It must also be emphasized that certain species of fish, such as koi and grass carp, grow to considerable sizes, and the standard recommendation of two to four feet depth may not be enough. Depending on the amount of koi present in the pond, it may need a depth of up to twenty one feet. If a pond becomes too crowded due to not having enough space, not only will the water quality rapidly decline, but the fish could potentially fight and harm one another.